Dhaka, 16 October, Abnews: Members of Counter Terrorism and Transnational unit and Special Weapons and Tactics are carrying out a joint operation codenamed ‘Gordian Knot’ in a ‘militant den’ at Bhagiratpur on Tuesday while kept another den cordoned off at Madhabdi in Narsingdhi since Monday night. Abul Kalam, officer-in-charge (investigation) of Madhabdi Police Station, said over 100 police surrounded the seven-storey building of Afzal Haji in Gangpar area under Madhabdi municipality and another 5-storey building of cloth trader Billah Hossain in Bhogiratpur area around 9 pm Monday. Two teams of Special Weapons and Tactics (SWAT) and Detective Branch joined the CTTC team at night. Meanwhile, CTTC Chief Monirul Islam reached the spot in Bhogiratpur area at 9 am Tuesday and briefed reporters that they were suspecting that some 3-4 militants have been staying along with explosives inside the house. 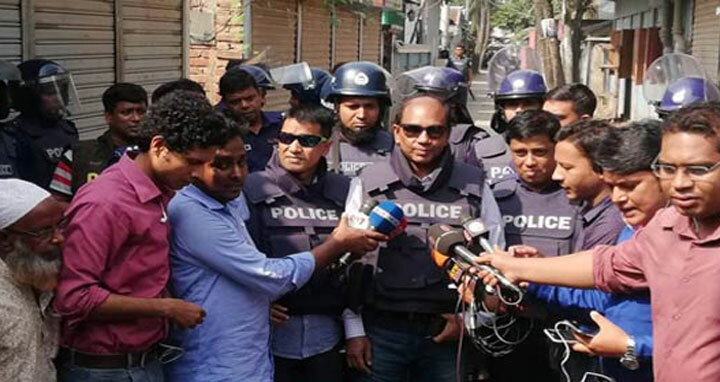 After the arrival of Deputy Inspector General (DIG) of Dhaka Range Chowdhury Abdullah Al-Mamun, PPM, at the spot around 10:10 am, Monirul Islam urged the militants over loudspeaker to surrender. But, there is no report of any headway. Later, a SWAT team entered the den around 11:30am and started their drive. Several gunshots were heard from the den during the operation. Inspector General (IG) of Bangladesh Police Dr Mohammad Javed Patwary reached the spot around 12pm. Earlier at night, the district administration imposed section 144 in and around 500-yard areas of both the buildings, said Shah Alam Mia, executive magistrate of Sadarupazila.